4 8086 / 8088 CPU operating at 2.5 / 5MHz. 4 8086 Processor can be replaced by 8088 Processor. 4 On – board sockets provided to facilitate the use of 8087 Co – processor and 8089 I/O Processor. 4 16K bytes of RAM with Battery Backup expandable upto 256KB. 4 16K bytes of powerful monitor EPROM. 4 48 I/O lines through 2 nos. of 8255 brought at 26 Pins FRC Connector. 4 24 I/O lines through 1 no. of 8255 brought at 25 Pins D-type Connector for Printer Interface. 4 16 bit Timer / Counter through 8253. 4 RS – 232C interface using 8251. 4 On – board Interrupt controller using 8259. 4 20 x 2 Backlite LCD Display with 101 ASCII Keyboard. 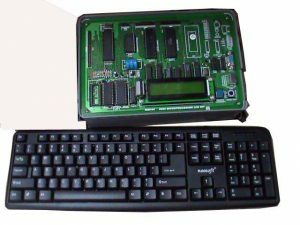 4 Powerful Commands like Examine / Edit Memory, Examine / Edit Resistor, Single stepping, Execution, Block Move can be used through hex keyboard or PC serial mode. 4 Facility for downloading / uploading files from / to PC. 4 All address, data and control lines are available on 50 pin FRC Connector. 4 In – built power supply of + 5V / 1A, + 12V / 150mA. 4 User’s manual with sample programs.